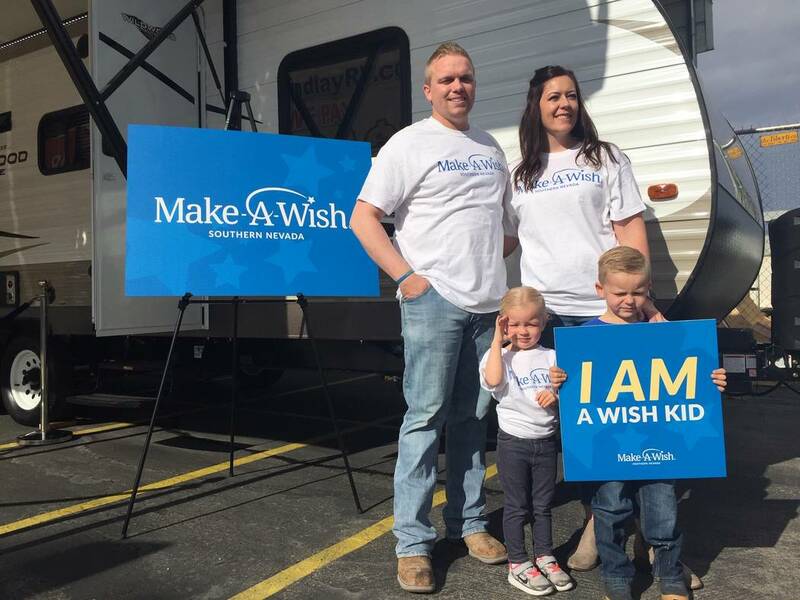 Findlay Automotive Group’s Findlay RV and Make-A-Wish Southern Nevada have come together to provide a Forest River Wildwood Lite travel trailer that retails for more than $31,000. The trailer was given to Brad and Amy Campbell of Alamo during a recent ceremony at Findlay RV,4530 Boulder Highway. Findlay Automotive Group’s Findlay RV and Make-A-Wish Southern Nevada have come together to provide a Forest River Wildwood Lite travel trailer that retails for more than $31,000. The trailer was given to Brad and Amy Campbell of Alamo during a recent ceremony at Findlay RV, 4530 Boulder Highway. The Campbells’ son, 5-year-old Tyce, was diagnosed with cancer when he was 21 months old. He lost his left leg during the battle but continues to impress everyone he meets getting around just fine with a prosthetic limb. The Campbells have rented travel trailers in the past and really enjoyed the experience. The family lives about 90 miles northeast of Las Vegas and within a short distance of several outdoor adventures, so there’s no question the Campbell family will have many opportunities to use the new trailer. Pendgraft found out that Tyce was very outdoor-oriented, so she reached out to Findlay RV General Manager Reuben Figueroa. In the Campbells’ situation, family time is a highly valued commodity. Tyce’s father Brad, a highway patrol officer, is really appreciative of all the additional time they’ll be able to spend together. The trailer has plenty of room inside with bunk beds for the children. “Findlay RV is proud to be partnered with Make-A-Wish Southern Nevada to make this wish possible,” Figueroa said. It marked the second time that Findlay RV procured a trailer, after another similar donation at a NASCAR event at Las Vegas Motor Speedway this past September. Make-A-Wish Southern Nevada grants the wishes of children between the ages of 2½ and 17. After a child is referred, Make-A-Wish Southern Nevada works with the treating physician to determine the child’s eligibility for a wish. “For Tyce, that one true wish was to have a travel-trailer by which he can have many camping experiences with his family,” Pendgraft said. Further information regarding Make-A-Wish Southern Nevada can be found by visiting snv.wish.org. Further information regarding Findlay RV can be found at www.findlayrv.com or by calling or texting 702-435-2500. The dealership is owned by Michael Hohl and Cliff Findlay. Further information regarding Findlay RV can be found at www.findlayrv.com or by calling or texting 702-435-2500. The dealership is owned by primary owner Michael Hohl and Cliff Findlay. Hohl also owns and operates several dealerships in Carson City, including a GM Super Store, Honda, Subaru and Battle Born Harley Davidson. Findlay Automotive Group was founded by the late Pete Findlay in 1961. The umbrella now includes 33 dealerships in Nevada, Utah, Idaho, California, Arizona and Oregon.